Since 2008, National University of Tainan (NUTN) in Taiwan, Taiwanese Association for Artificial Intelligence (TAAI), and other academic organizations have hosted or organized several human vs. computer Go-related events in Taiwan and in IEEE CIS flag conferences, including FUZZ-IEEE 2009, IEEE WCCI 2010, IEEE SSCI 2011, FUZZ-IEEE 2011, and IEEE WCCI 2012. In 2008, MoGo challenged three games against Mr. Chun-Hsun Chou (9P) at NUTN. MoGo lost all of the three games (one 9x9 and two 19x19). But in February, 2009, the computer Go MoGo won Chun-Hsun Chou (9P) with 7 handicap stones. Through the past held activities, the Computer Go programs accumulate considerable quantities knowledge of the opening book. In addition to observing how many advances have been made in artificial intelligence, the competition held at TAAI 2012 also estimated the human’s Go level via playing with computer Go program. Because Go is the deepest known game for the classical “depth” criterion, so it is “the Most Strategic Game”. Nowadays, humans are still stronger than computers, in particular for the big 19x19 board, where strategic elements matter a lot. We will see how far computers are from humans now. B. Bouzy and T. Cazenave, “Computer Go: an AI-oriented survey,” Artificial Intelligence Journal, vol. 132, no. 1, pp. 39-103, 2001. C. S. Lee, M. Mueller, and O. Teytaud, “Special Issue on Monte Carlo Techniques and Computer Go”, IEEE Transactions on Computational Intelligence and AI in Games, vol. 2, no. 4, pp. 225-228. Dec. 2010. Y. Wang and S. Gelly, “Modifications of UCT and sequence-like simulations for Monte-Carlo Go,” in Proceedings of the 2007 IEEE Symposium on Computational Intelligence and Games (CIG07), Hawaii, USA, 2007, pp. 175-182. C. S. Lee, M. H. Wang, C Chaslot, J. B. Hoock, A. Rimmel, O. Teytaud, S. R. Tsai, S. C. Hsu, and T. P. Hong, “The computational intelligence of MoGo revealed in Taiwan's computer Go tournaments,” IEEE Transactions on Computational Intelligence and AI in Games, vol. 1, no. 1, pp. 73-89, Mar. 2009. C. S. Lee, M. H. Wang, T. P. Hong, G. Chaslot, J. B. Hoock, A. Rimmel, O. Teytaud, and Y. H. Kuo, “A novel ontology for computer Go knowledge management,” in Proceeding of the 2009 IEEE International Conference on Fuzzy Systems (FUZZ-IEEE 2009), Jeju Island, Korea, Aug. 19-14, 2009, pp. 1056–106. S. J. Yen, C. S. Lee, and O. Teytaud, “Human vs. computer Go competition in FUZZ-IEEE 2009,” ICGA Journal, vol. 32, no. 3, pp. 178–181, Sept. 2009. J. B.Hoock, C. S. Lee, A. Rimmel, F. Teytaud, M. H. Wang, and O. Teytaud, “Intelligent agents for the game of Go,” IEEE Computational Intelligence Magazine, vol. 5, no. 4, pp. 28-42, Nov. 2010. C. S. Lee, M. H. Wang, O. Teytaud, and Y. L. Wang, “The game of Go @ IEEE WCCI 2010,” IEEE Computational Intelligence Magazine, vol. 5, no. 4, pp. 6-7, Nov. 2010. M. H. Wang, C. S. Lee, Y. L. Wang, M. C. Cheng, O. Teytaud, and S. J. Yen, “The 2010 contest: MoGoTW vs. human Go players,” ICGA Journal, vol. 33, no. 1, pp. 47-50, Mar. 2010. C. S. Lee, O. Teytaud, M. H. Wang, and S. J. Yen, "Computational Intelligence Meets Game of Go @ IEEE WCCI 2012," IEEE Computational Intelligence Magazine, vol. 7, no. 4, Nov. 2012. S. J. 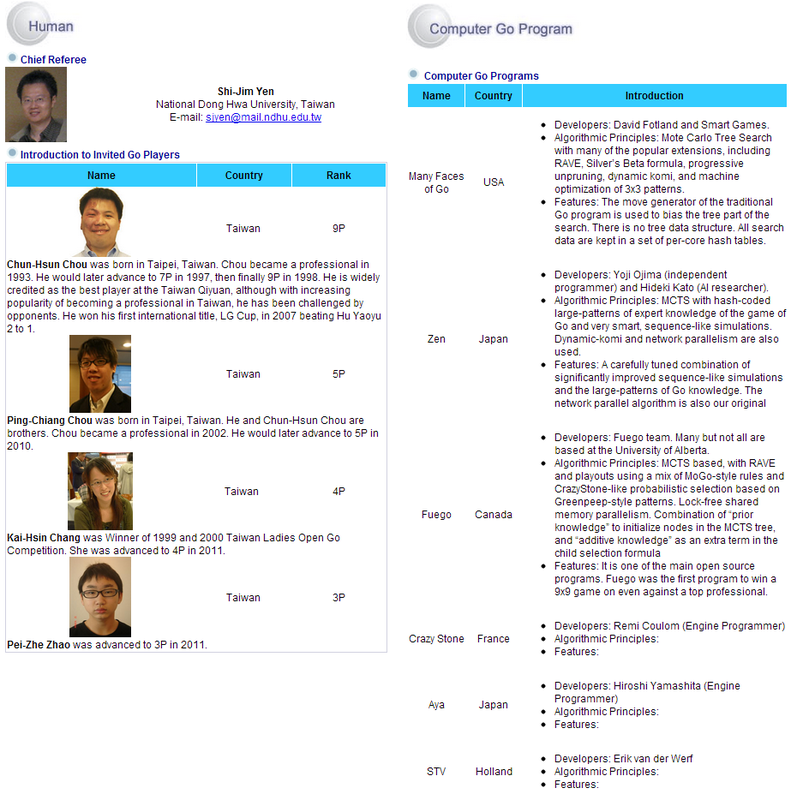 Yen, C. W. Chou, C. S. Lee, H. Doghmen, and O. Teytaud, "The IEEE SSCI 2011 Human vs. Computer Go Competition," ICGA Journal, vol. 34, no. 2, pp. 106-107, Jun. 2011. This website is supported by a grant from 抬丸郎 of Google Apps for Education.